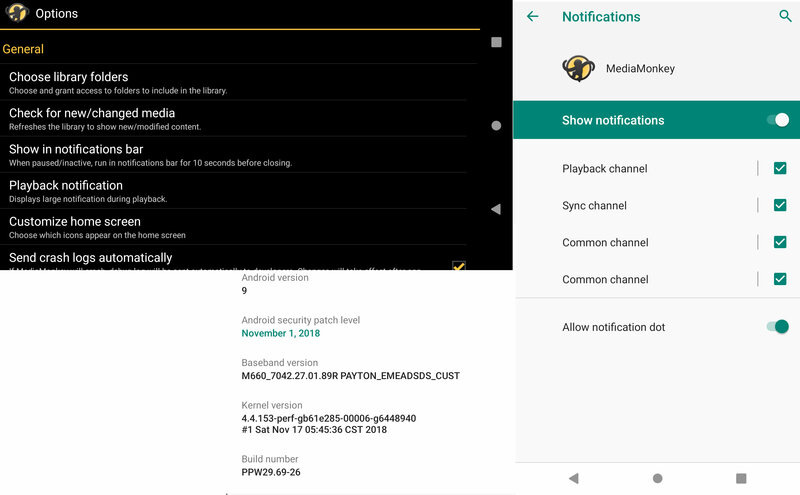 Any known issues with Android Pie and v1.3.3.0827 I need to be aware of? 1.3.3.828 is out and you should check it, but no Pie specific issues are reported. It is bit early to tell if some will popup as not many devices officially got the upgrade. Previously, when I stop playing (as opposed to pause), the MediaMonkey notification will go away and stay away until I next play from it. Now, the stop will make it go away but it comes back usually in a few seconds to a minute. I want the notification to be gone when I dismiss it. Pie has changed how notifications are handled. You can go to app linfo and Notifications where you can manually clear all non needed Notifications for apps. If That is not the case please make screenshot of notification and we will try to figure out what is triggering it. EDIT: I was very annoyed with that feature, especially one that reports mostly all apps running in background. It is the playback channel. If i disable, then the controls will not be in the notification panel when music is playing. How do I post a screenshot here? In My signature you have link to tutorial on how to add screenshot to forum. Preview is not showing the images. Below are images from Box.com. Below are images from Google Drive. Below are images from Google photos. From what I see looks like MMA service is running in background so it can react to Media Events from headset or other BT Device ot react to Connection events if you use wired headphones. Have you tried my settings and have you disabled all event reactions in options? I was focused on the "Notifications", but I should have seen the "Show in notifications bar" which was set to "always". I changed that to 1 minute, and it now works as expected. Thank you for your help. My pleasure, I know how I was annoyed when X4 upgraded to Pie. Glad we found the resolution and cause.